I just deployed a small but helpful feature. As part of my efforts toward getting post by email ready I added in automatic expansion of URLs into their related embed codes. Instead of tracking down embed codes from other sites just try pasting the URL of the content on its own line in the body of your post. After you save we'll do our best to look up the URL and expand it into an embed code for you. It's great for stuff like video embeds, audio embeds and code snippets and works for a variety of sites like YouTube, Vimeo, Soundcloud, GitHub Gists, Twitter, and Pastebin. 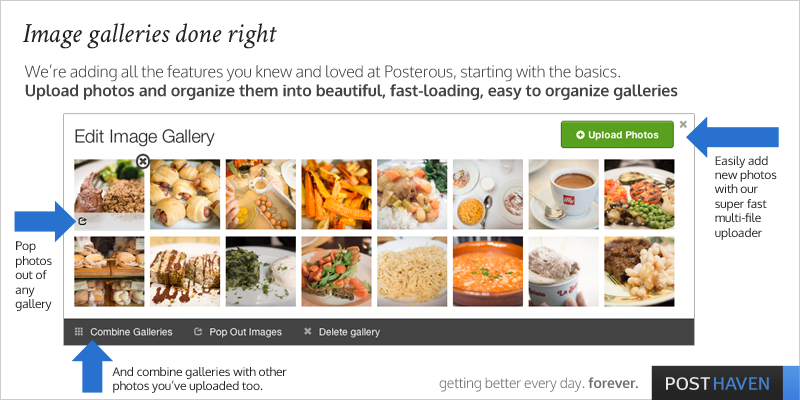 We're proud to announce fast, simple, beautiful image galleries are now available on Posthaven. You can upload multiple files all at the same time (press the SHIFT key when selecting files) and our post editor will upload them directly to Amazon S3 where we'll host them for you. One thing we were super careful of this time is that we now preserve the order in which you upload — you've asked for this and we made sure it happened. Just click on it and you'll be greeted with a simple way to upload more photos to that gallery, combine that gallery with other images in the same post, or pop individual ones out. It's a great way to tell stories. We've also revamped our image gallery code on your blogs. They're the fastest galleries available on the web because we automatically pre-load all images in the background so that your blog viewers can flip through all the photos instantly with as little loading time as possible. Use the arrow keys to flip from left to right too! We also updated the mini previews at the top of every gallery so that they are more compact and elegant no matter how many photos you upload to a given gallery. All of this is available now at Posthaven. We're working hard to make this the best and most durable place to post. Thanks for your support. Thanks for importing! Sign up is available again. Thanks to everyone who signed up and imported from Posterous before their shutdown! It has been a hectic week making sure all the extra imports were running smoothly but now Garry and I are very excited to get back to focusing on Posthaven features. We've re-opened signups and added some information about our roadmap on our pledge page. With our work on features in mind we are not going have time to support import from the Posterous backup .zip files in the near term. If got caught off guard by the Posterous shutdown and were unable to move your data beforehand but still want to preserve it, then I encourage you to signup for a free Wordpress account and use the Wordpress export XML file included in your Posterous backup to import to Wordpress as soon as possible. Posterous import to Wordpress using that file will only be fully functional until May 31st after which Posterous will stop hosting all the media files referenced by the Wordpress XML exports. 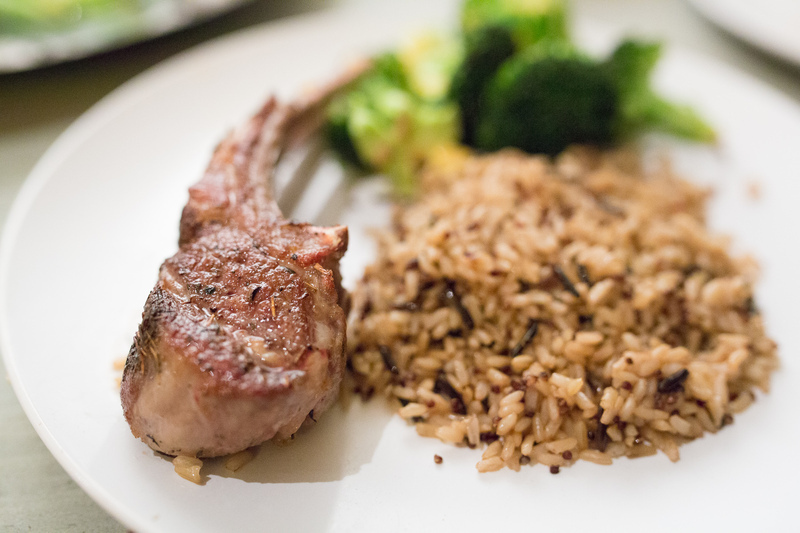 Brett and I continue to be busy working on all the features you know and loved from Posterous. 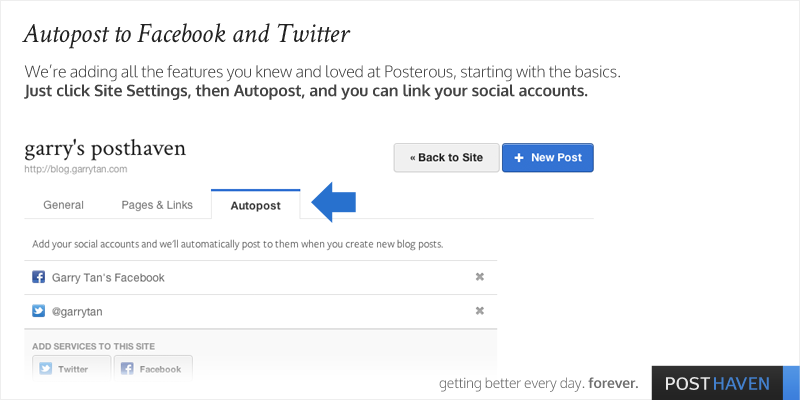 Here's the latest -- now you can add Facebook and Twitter autopost to your sites. It's on a per-site basis right now, but once you've linked your account it's one click to add them to your other sites (if you have others). We'll be adding Facebook Pages, Google+, App.net, and LinkedIn shortly. Commenting and post by email are both also very high on the list, so expect those in the near future. As you know, we're implementing what took us years to do previously, but we're trying to do it in just a matter of months! We appreciate your patience. Thanks for your support -- we can use all the help we can get to get the word out. Now you can edit, add, and delete pages, links and menus. Pages are just like posts -- they contain text, and any type of media. There's one navigation menu at the top of every site, and you can also create additional menus that will appear at the bottom of the left hand sidebar of your Posthaven. You can get to Pages & Links in the Site Settings area of any site. There are only 14 days left to import your posts from Posterous. Don't get left out in the cold. We're looking forward to bringing you a lot more, as soon as we can. 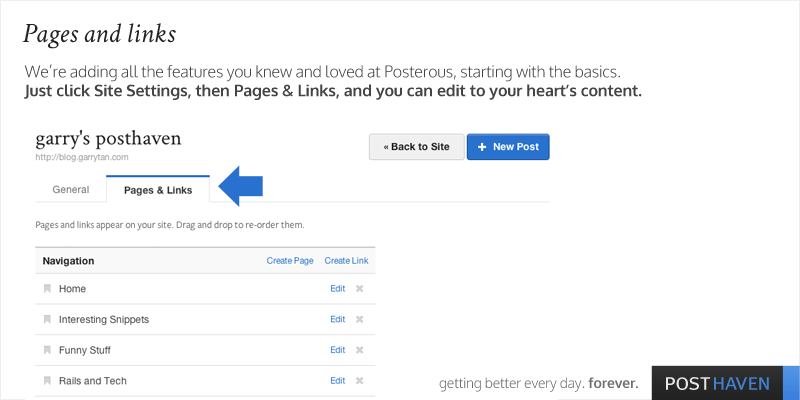 It took a larger team years to make all the things you liked about Posterous, and we're trying to do it in a few months. Thanks for your support, from both Brett and I.